Following up his 2013 Dove Award for Best Pop/Rock Album and the highest album debut by a new artist in Christian Music history, Colton Dixon delivers an inspiring collection of hope-filled new songs. Anchor showcases Colton's energetic piano playing and trademark balance of vocal tenderness and intensity. "Anchor" continues to allow Dixon to express himself in ways that are even more audacious and vulnerable relative to his debut. The album covers are most telling. Rather, than posing in his aloofness with his Billy Idol Mohawk hairstyle as on his debut album cover, "Anchor's" front picture depicts a helpless Dixon gasping for dear life in the middle of the ocean. Thus, if there is a theme that runs right through these 11 songs (with two brief interludes) it is Dixon's heart's cry for God's salvation in midst of our brokenness. 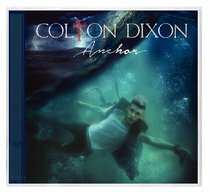 Part of the success of "Anchor" resides in Dixon's willingness to branch out in co-writing with some of the best writers in Contemporary Christian music including TobyMac, Matthew West, Ben Glover, David Garcia among others. The song that is the most reflective of Dixon's growth as a vocalist and writer is the title cut "Anchor," a song that speaks of our Savior's grace. Colton elucidates the deftness of such glorious message by decelerating the speed of the song towards the chorus and into the bridge where he deliberately takes his time to pound out the refrain (to God) "save my soul" as if to drill into our souls that God and Him alone can save us. Though "More of You" is not immediately recognizable as the lead single material, it is also most spiritually uncompromising song.